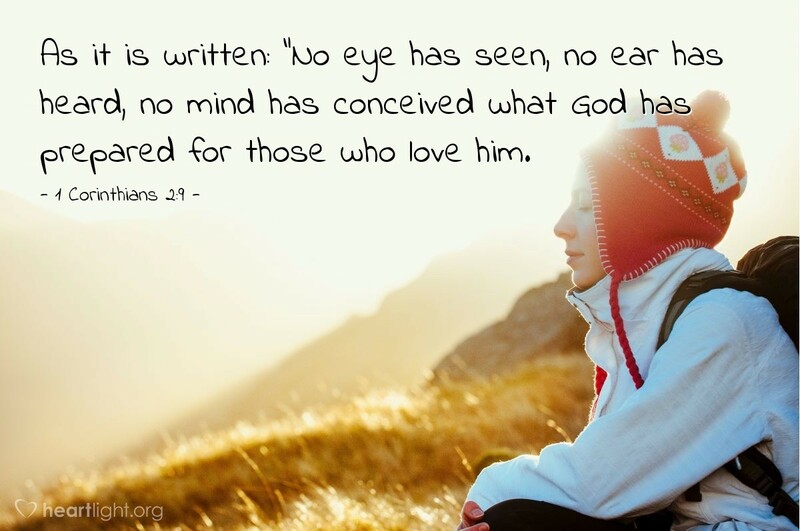 As it is written: "No eye has seen, no ear has heard, no mind has conceived what God has prepared for those who love him. Many of the things we anticipate and dream about are much less glorious in real life than they were in our imaginations. There is one event, however, that is better than we can imagine and beyond our wildest dreams. When Jesus returns to take us home to be with our Father, it will be far better than we can ask, imagine, dream or think. Maranatha — Come Lord Jesus! Abba Father, thank you for knowing me before time began. Thank you for crafting me in my mother's womb. Thank you for sending Jesus to pay the price for my sins. And thank you in advance for the day Jesus comes to take me home to be with you forever. Through my Conquering Savior I pray. Amen.